We like airguns — they’re fun, quiet, and cheap to shoot (compressed air is cheaper than gunpowder and primers). Now’s a great time to purchase a new air rifle, or get airgunning tools and accessories. Now through 3:00 am on May 17th, Pyramyd Air, the USA’s leading airgun retailer, is offering 20% off airguns, optics, and accessories from over 50 name brands. You’ll find a huge selection of airguns on sale — from $50 BB Guns to $3500 Olympic-grade air rifles. Along with the 20% off discount, Pyramyd Air is offering FREE Shipping with orders over $150.00. But act soon — these offers expire at 3:00 am EST on May 17, 2017. To get 20% off, use Promo Code 17-BDAY. Leading brands now 20% off include: Air Venturi, Benjamin, Beretta, Browning, Colt, Crossman, CZ, Gamo, Remington, Ruger, SIG, Smith & Wesson, Swissarms, Umarex, Walther and more. 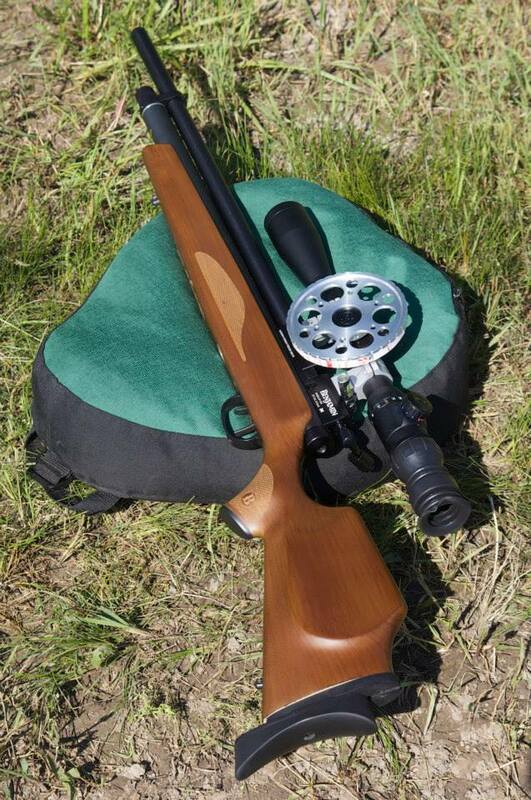 Here’s one of the Walther air rifles on sale, the handsome German-crafted MaximaThor model. Designed for varmint hunting, this air rifle features a Lothar Walther barrel threaded for a silencer, plus an 8-round rotary magazine. In 22-caliber it delivers 44 ft-lbs of energy at 1260 fps. Share the post "Pyramyd Air Birthday Sale — 20% Off and Free Shipping"
The annual NRA convention kicks off today in Louisville, Kentucky. One of the most enjoyable things to do at the show is shooting airguns. For the 7th consecutive year, the NRA Competitive Shooting Division and Pyramyd Air will operate an Airgun Range during the NRA Annual Meetings & Exhibits. You’ll find the Pyramyd Air Airgun Range at Kentucky Exposition Center Booth #2684. The range opens at 2:00 pm on Thursday, May 19th and operates through Sunday, May 22nd. Thursday, May 19: 2:00 p.m. – 6:00 p.m. Saturday, May 21: 8:00 a.m. – 6:00 p.m.
Friday, May 20: 8:00 a.m. – 6:00 p.m. Sunday, May 22: 9:00 a.m. – 5:00 p.m.
“Pyramyd Air is thrilled to sponsor the Airgun Range again this year [as] we are also celebrating our 20th Anniversary,” said Pyramyd Founder/CEO Joshua Ungier. The Airgun Range in Booth #2684 is open to all ages (minors must be accompanied by an adult). The firing line is supervised by NRA Certified Instructors. The range is stocked with airguns appropriate for all ages along with ammo and interactive targets. Products from Air Arms, AirForce, Ataman, Air Venturi, Beeman, BSA, Crosman, Evanix, Gamo, Sam Yang, Sig Sauer, Stoeger and Umarex will be available at the Airgun Range. May, 2016 marks the 20th anniversary of Pyramyd Air. In the past two decades, Pyramyd Air has grown from a 3-person basement operation into a multi-million-dollar company with 60+ employees. Pyramyd Air is now the largest online airgun retailer in the world. Twenty years after purchasing his first shipment of air rifles from England, Pyramyd Air CEO Joshua Ungier recalls the struggles of entrepreneurship: “In order to expand I needed a lot more money, so naturally I went to the bank seeking a loan. When I told the bank manager what I needed the money for he simply stared at me. At that point I knew it was futile and I would need to find a different way.” Ungier approached his wife, and after borrowing from her, he outgrew his basement and moved to a small warehouse. “Within a few years I moved to a larger warehouse, then another. Twenty years and 60,000 square feet later, we’re a far cry from my basement,” Ungier said with pride. Share the post "Pyramyd Air Runs Airgun Range & Celebrates 20 Years in Business"
You are looking at the Texan, the world’s most powerful airgun. Able to launch a .45-caliber projectile at 1000 fps, this pre-charged pneumatic air rifle rivals the energy of a centerfire pistol. The $1000-dollar Texan is a game changer. The Texan’s manufacturer, AirForce Airguns, has created the “world’s most powerful” production air rifle. With projectile energy levels topping 500 foot-pounds (see below), the Texan possesses capabilities never before seen in an airgun. Shooting a 405gr hollow-base lead projectile the Texan registered energy (at muzzle) of 505.98 foot-pounds for the first shot. Velocities at or near 1000 fps were recorded with smaller projectiles in the 120-140gr range. At right is a chart with results from Texan airgun testing by Tom Gaylord of Pyramyd Air. Share the post "Behold the World’s Most Powerful Air Rifle — The Texan"
This fall, Pyramyd Air will host its first-ever major air rifle competition. The Pyramyd Air Cup will be held October 24-26 at the Tusco Rifle Club in New Philadelphia, Ohio. Air gunners from all around the world, amateur and professionals alike, will compete for glory and valuable prizes. The weekend will feature field target and silhouette competitions, with four divisions: Pro PCP, Pro Springer, Sportsman PCP, and Sportsman Springer. Cash and prizes will awarded to the best shooters in each division. Prizes and cash will be awarded to the first, second, and third place finishers in each division, with the top prize valued at $750. The grand champion — the individual with the highest overall score — gets an additional $1,000 cash prize. For the PayDay Challenge, the winner gets $200 from a mere $5 entry fee! The Pyramyd Air Cup will take place over two days. Each competition will have its own set of guidelines. Competitors will shoot in either the pro or sportsman division with classes based on airgun type: PCP or springer. The Field Target portion of the event is governed under the rules of the American Field Target Association. The silhouette portion will consist of two competitions: off-hand and gunslinger. Share the post "Pyramyd Air Hosts First-Ever Pyramyd Air Cup in October"
Looking for a gift for a young shooter in the family? Perhaps a niece or nephew, grandson or grand-daughter? Then head over to the Pyramyd Air website. Pyramyd, the nation’s largest retailer of air rifles and air pistols, has a huge selection of airguns that can provide the perfect introduction to the shooting sports for a youngster. And right now, Pyramyd is running a 12 Deals of Christmas Special, with new bargains every day through December 15th. Pyramyd also offers FREE Shipping on orders over $150.00. That all adds up to impressive savings on gift items for this holiday season. Pyramyd offers a vast collection of air rifles, from $35.00 Red Ryder BB guns to $3700.00 Olympic-class air Rifles from Anschutz and Feinwerkbau. Share the post "Holiday Savings on Air Guns from Pyramyd Air"
With the price of reloading components rising and .22 LR rimfire ammo being difficult to obtain, more shooters are looking at air rifles for training and competition. With air rifles, the propellant is free, and pellets are cheap and readily available from local stores or web vendors such as Pyramyd Air. 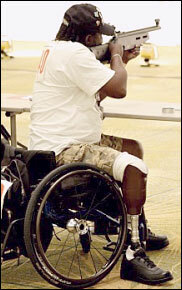 UPDATE: The 2013 Extreme Benchrest Event is being held November 8-10 at the Quail Creek Gun Club. Friday the 9th was an open shooting day. The actual competition starts Saturday November 10th. You can still show up and compete if you register before 10 a.m. on Saturday. A variety of matches (benchrest, field target, silhouette, and pistol) will be held over the weekend. The video below shows a very popular air rifle match — the Extreme Benchrest Event held at the Quail Creek Gun Club, in Green Valley, Arizona (south of Tucson). Many types of shooting took place over a full weekend. A 25m benchrest match was followed by the popular steel silhouette speed match (shot from the bench). Both indoor and outdoor pistol matches were held. There was even a “Extreme” Benchrest match, with bullseye targets placed at 75 yards (that offered plenty of challenge). This is very nicely made video, well worth watching. Enjoy! Though you won’t experience the recoil, blast, and noise of centerfire shooting, air rifle shooting still offers the challenge of hitting the target, just like any other shooting sport. With an air rifle you save money and there are fewer regulations (no FFL is required for an air rifle purchase). Modern air rifles can be very accurate. The top-of-the-line air rifles are not kids toys — these are sophisticated, finely-machined systems capable of surprising accuracy. And you won’t lack for competition opportunities. Around the country there are air rifle matches for both position shooters and benchrest competitors. Share the post "Great Video Showcases Extreme Air Rifle Competition in Arizona"
Yes, size matters — at least when it comes to gun safes. Is your current safe bursting at the seams with your ever-growing firearms collection? Perhaps you need a little more vertical clearance for your Lahti L-39 or favorite Punt Gun? Well Superior Safe Co. has a solution for you — a humongous safe that stands 10-feet tall and weighs more than a pick-up truck. For reference, the young man in the picture, Greg from Pyramyd Air, is an honest 6’3″ tall. A punt gun is an extremely large shotgun used in the 19th and early 20th centuries for shooting large numbers of waterfowl for commercial harvesting operations and private sport. Punt guns could have bore diameters exceeding 2 inches (51 mm) and fire over a pound of shot at a time. A single shot could kill over 50 waterfowl resting on the water’s surface. Punt guns were too big to hold so they were often mounted directly on the punts (boats) used for hunting, hence their name. Generally the gun was fixed to the punt, requiring the hunter to manuever the entire boat to aim the gun. Firing the gun often propelled the punt backwards from recoil. Sometimes fleets of punt gun-boats were used together. In the United States, this practice depleted stocks of wild waterfowl and by the 1860s most states had banned the practice. In the United Kingdom, a 1995 survey showed fewer than 50 active punt guns still in use. UK law limits punt guns to a bore diameter of 1.75 inches (1 1/8 pounder). Learn more at Wikipedia.com. Lahti L-39 photo, courtesy Gordon Greene, originally appeared in The Gun Zone. Share the post "Superior’s Super-Sized Safe — For Really BIG Gun Collections"
Pyramyd Air, the leading online airgun retailer, has developed two smart phone Apps for airgun shooters and airsoft shooters. Pyramyd’s FREE Air Wizard App is offered for both Apple iPhones (go to: iTunes Store) and Android OS phones (go to: Android App Market). The Air Wizard Apps calculate muzzle energy (based on projectile weight and observed velocity). The Apps can do a host of conversions: foot-pounds to joules, joules to foot-pounds, grams to grains and grains to grams, pounds to pounds and ounces, feet to yards, yards to feet, meters to yards, yards to meters, Fahrenheit to Celsius, Celsius to Fahrenheit, FPS (feet per second) to MPS (meters per second) and MPS to FPS. Most of these calculations work for all gun types — airguns, firearms and airsoft. For airsoft guns, the Apps offer additional computations including determining joules, meters per second (MPS), feet per second (FPS), kilometers per hour and battery time for auto-electric guns (AEG). Pyramyd Air provides professional product videos from Airgun Reporter Paul Capello. Pyramyd’s Tom Gaylord, a.k.a. B.B. Pelletier writes a highly respected daily Blog, the Pyramyd Air Report. Pyramyd also provides instructional videos through its online Airgun Academy. Share the post "Free iPhone and Android Airgun Apps from Pyramyd Air"
The NRA Annual Meeting & Exhibits in St. Louis opens tomorrow morning, April 13th. (Hopefully a Friday the 13th launch won’t bring bad luck). However, doors opened at 2:00 pm CST for advanced registration, and some of the outer exhibits will be available for viewing this afternoon. The NRA Foundation’s Banquet and Auction starts at five this evening. When the “main event” kicks off tomorrow, there will be plenty to see and do. In addition to the many seminars for NRA members, you can view more than 500 exhibits, filling 340,000 square feet of floor space. Virtually all the major gunmakers in the country should have their latest products on display. You’ll even find an airgun range on site where you can shoot air rifles provided by Pyramyd Air. Photo provided by the NRA Blog, Lars Dalseide editor. Share the post "2012 NRA Annual Meeting & Exhibits Get Underway"
If Anschütz decides to export the Black Air IWA special model 8002 S2 to the United States, it should be available from PyramidAir.com. We expect the price to be about $2,300, but that’s a guess. Current price for a standard wood-stock m8001 is $1599.00, while a m8002 in metal stock is $2,370. Share the post "New m8002 S2 ‘Black Air’ IWA Special from Anschütz"
At the Pyramyd Air booth we ogled high-end competition air rifles from Feinwerkbau and Anschutz. These are Olympic-grade rigs, with prices (for the Anschutz) approaching four grand fully outfitted with all the accessories, plus premium sights. It’s obvious the Germans take accuracy very seriously when it comes to airgun engineering. We were quite surprised to see a full-auto offering among the many new products on display. Evanix of South Korea is now producing a pair of self-loading, pre-charged pneumatic air rifles that can shoot in either semi-auto or full-auto modes. When running full auto, the electronically-controlled servo breach can cycle pellets at the equivalent of 400 rounds per minute. We’re not sure why full auto capability is needed, but this certainly offers a new experience for the air gun crowd. An airgun is definitely the cheapest way to go if you have a hankering for “hosing down targets” (quoting the AirGun Reporter video below). We do like the self-loading feature for general plinking and “fun gun” use, and the 2.5-lb trigger is decent for bench use. The Evanix Conquest sells for $1699.99. Being a brand new product, the Conquest is not yet in stock but Pyramyd is taking pre-orders now. To see how the Conquest operates in full-auto mode, watch the video below. Share the post "SHOT Show: Match Air Rifles and Full-Auto Pneumatics"
As a fan of the classic big-frame Dan Wesson revolvers, this editor did a double-take when I saw the latest addition to Pyramyd Air’s line of BB guns. Pyramyd Air now sells four very authentic-looking, metal-framed CO2-powered BB Revolvers, marked “Dan Wesson”, with the distinctive “DW” logo on the grip. These BB-shooting revolvers are offered in four different barrel lengths: 2.5″, 4.0″, 6.0″, and 8.0″. The revolvers are loaded by placing .177 BBs in mock cartridge shells, which fit into the chambers of the swing-out cylinder — just like on a real revolver. Max velocity, for the 6″-barrel version, is 426 fps. These BB guns are handsome and they have the feel and heft of the real thing. The 4″ version weighs 1.94 pounds, while the 6″ version weighs 2.21 pounds. All four sizes (2.5″, 4″, 6″, 8″) cost just $119.99 each. Take your pick — either silver finish or black (but not all sizes available in both colors). The Dan Wesson BB revolvers come with adjustable rear sights. An owner-installable, Weaver-type scope rail is packaged with each revolver to allow use of Red-Dot scopes or other optics. A speedloader and six “cartridges” (shown above) are also included with each revolver. To see how the CO2 cartridge fits in the gun, check out the Airgun Academy Dan Wesson Review. If you’re interested in the Dan Wesson BB Revolvers, visit PyramydAir.com or call (888) 262-GUNS (4867). Note, quantities are limited. While you’re shopping at Pyramyd Air, you can use Coupon Code AirgunsNov30-2011 to save 10% on purchases. This Code expires 12/6/2011 and cannot be combined with other offers. We expect these guns will be popular for indoor training, and for fun plinking outdoors. We also predict Dan Wesson collectors may snap them up to add to their collection. Unfortunately, you need to purchase a different BB revolver for each barrel length. The real centerfire Dan Wesson revolvers featured a unique interchangeable barrel system with barrels threaded on both ends inside metal shrouds. Buyers could order one frame with multiple barrel/shroud assemblies. Dan Wesson even sold multi-barrel “Pistol Packs” in a fitted metal case. These Pistol Packs, if complete with all barrels and accessories, are highly prized by gun collectors today. Share the post "Dan Wesson Clone Revolvers — Now THAT’s a BB Gun"
Proposed gun laws based on flawed technology were recently defeated in New York and California. In New York, A1157, a micro-stamping bill, was effectively halted in the New York State Senate. Meanwhile, across the country in California, the California Assembly Public Safety Committee voted down SB 978, a bill that would have required all air rifles to be brightly colored. In New York, A1157, which earlier this year passed the General Assembly, failed to be voted on in the New York State Senate. This marks the fourth straight year that microstamping has been defeated in the Empire State. The proposed legislation would have required micro-stamping of handguns. This technology has not yet been perfected and it can easily be defeated by criminals. Requiring microstamping of all new handguns would force manufacturers to invest in very expensive machinery (or go out of business). Increased manufacturing costs would be passed on to the firearms consumer. To learn more about microstamping, read the NSSF Microstamping Fact Sheet. Last week, the California Assembly Public Safety Committee defeated SB 798, a bill that would have mandated that all airsoft and airguns (included Olympic-grade pneumatic air rifles) be brightly colored. In theory, this would help police officers distinguish airguns from actual firearms. In fact, because anyone can spray paint a firearm a bright color, this law would have jeopardized the safety of the public and especially police officers. AB 798 was defeated in large part because of opposition from law enforcement groups who understood the risk of criminals painting real firearms to disguise the weapons’ lethality. AB 798 is one more example of “feel good” legislation that would do more harm than good. Share the post "Restrictive Gun Laws Blocked in New York and California"
Registration opens this year and offers a great chance for you to take care of this early, allowing you to walk right by the line and into the convention center Friday morning. Pyramid’s indoor Air Gun range in the Lawrence Convention Center opens at 2 pm today. For a $1.00 fee you can shoot the latest models of air rifles, air pistols, air silhouette rifles and 10-meter running game target rifles. CLICK HERE to see all the different models available. At the Guns and Gold Showcase in the Convention Center upper lobby, experts from the National Firearms Museum can evaluate your antique guns, explaining markings and appraising current market values. This evening’s National NRA Foundation Banquet (ticket required), includes dinner, silent auctions, games, and special drawings with all proceeds going to support The NRA Foundation. Share the post "NRA Annual Meeting Activities Commence This Afternoon"